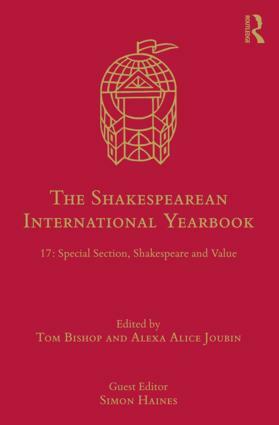 Currently in its seventeenth year and formerly published by Ashgate, The Shakespearean International Yearbook surveys the present state of Shakespeare studies, addressing issues that are fundamental to our interpretive encounter with Shakespeare's work and his time, across the whole spectrum of his literary output. Contributions are solicited from among the most active and insightful scholars in the field, from both hemispheres of the globe. New trends are evaluated from the point of view of established scholarship, and emerging work in the field encouraged, to present a view of what is happening all around the world. Each issue includes a special section under the guidance of a specialist Guest Editor, as well as a review of recent critical work in Shakespeare studies. An essential reference tool for scholars of early modern literature and culture, this annual captures, from year to year, current and developing thought in Shakespeare scholarship and theater practice worldwide. 2. Why is Shakespeare the World’s Most Performed Dramatist?